New policy will give families of Filipino veterans an easier path to immigration. 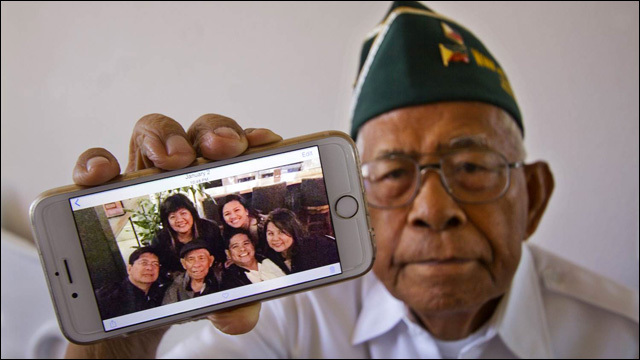 This week, the White House announced that family members of Filipino World War II veterans will be granted special permission to reunite with their parents and come live and work in the United States. Filipino American veterans, who have been waiting for years to bring family members to the United States, will soon be able to do so through the Obama administration's new policy, announced with a spate of other recommendations to modernize and streamline the legal immigration system. This has been a long time coming. During World War II, the U.S. government promised Filipino soldiers citizenship in recognition of their service, but it took more than fifty years to make good on that promise. The new policy will help the thousands of these veterans, many who are elderly and in need of care, to reunite with their families. Under the current family immigration system, it can sometimes take decades to obtain a visa. n a report released Wednesday, the White House laid out plans for the legal immigration system, which has seen few changes since 1991. It includes an overhaul to modernize the way people apply for visas, much of which is currently paper-based and slow. The plan for a parole program for family members of Filipino veterans follows up on attempts in recent years to do right by the surviving veterans of the estimated 260,000 Filipino soldiers who fought for the United States during World War II. They were promised U.S. citizenship but then denied it, and waited until the 1990s to finally be eligible to become citizens. As many as 26,000 Filipino World War II veterans became U.S. citizens, and an estimated 6,000 of them are still alive and living in the country, according to the White House. As citizens, they are eligible to petition for family members to immigrate to the U.S., but the backlogged visa system, particularly from the Phillippines, means some might not be able to reunite with family during their lifetimes. We are talking about men who put their lives on the line for the United States during the second World War. America, this is has taken waaaaaaaay too long.